Early detection can make a world of difference when it comes to treating cancer, but the most accurate results can often require invasive procedures. In the future, doctors may be able to detect tumors with precision by simply slipping on a glove. 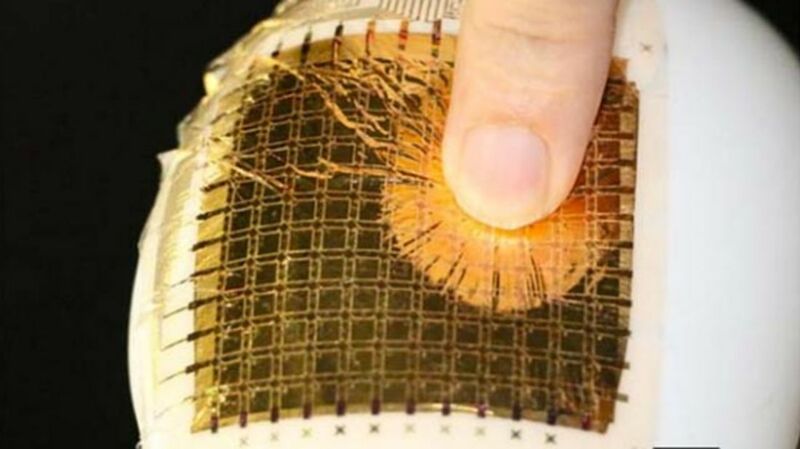 In a report recently published in Nature Nanotechnology, a team of scientists from Harvard and the University of Tokyo revealed new, ultra-thin sensors that may one day be used to make "skin-tight, tumor-detecting" wearables, as Gizmodo reports. While tiny, flexible sensors have been developed in the past, figuring out a way to ensure that those sensors accurately measure pressure has proved to be a challenge. Most sensors become distorted and inefficient when wrinkled, but this new technology could lead to the development of high-tech gloves made specifically for the medical field. To build the material, the team of American and Japanese researchers used organic transistors and electronic switches to construct the pressure-sensitive nanofibers. Then, they wove the fibers together to make a porous, grid-like material that was no more than 8 micrometers thick, making it thinner than a sheet of plastic wrap. The sensors are capable of measuring the pressure of 144 locations simultaneously, and they could conceivably be wrapped around the hands of doctors to help them accurately check for tumors. Any results they find also could be digitally recorded by the glove and transmitted to other physicians who might examine the patient later on.